Description: Select an activity to run it. Prerequisite: Some of the activities are game orientated, but nonetheless still educational. 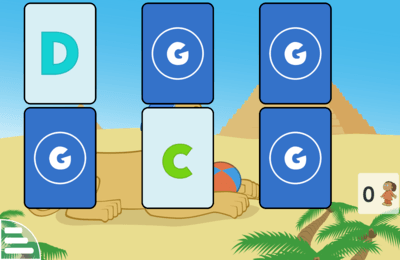 Goal: GCompris is a high quality educational software suite, including a large number of activities for children aged 2 to 10. Description: Press the left and right arrow keys at the same time, to make the ball go in a straight line. 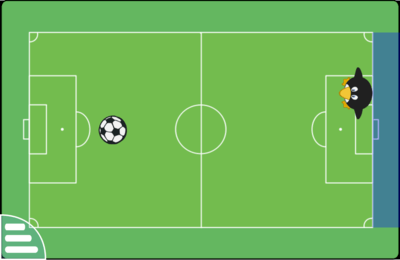 Manual: Press the left and right arrow at the same time, to make the ball go in a straight line. On a touch screen you have to hit the two hands at the same time. 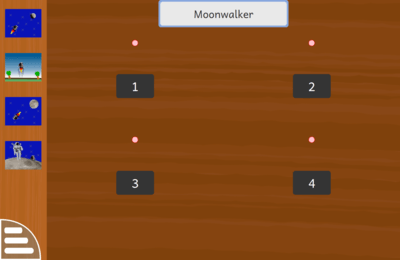 Manual: With the keyboard, type the number of dots you see on the falling dice. 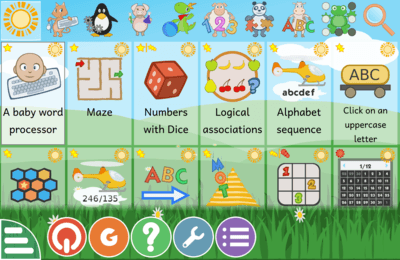 Description: A simplistic word processor to let the children play around with a keyboard and see letters. Goal: Discover the keyboard and the letters. 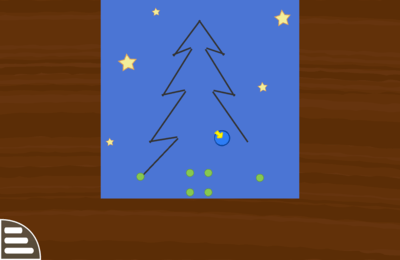 Description: Draw the picture by clicking on the selected points. Prerequisite: Can move the mouse and click accurately on points. Manual: Draw the picture by clicking on each point in sequence. Each time a point is selected the next blue one appears. Goal: Motor coordination: moving the hand precisely. 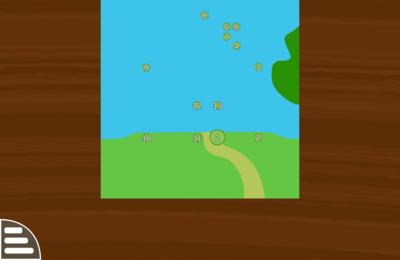 Manual: Catch all the moving fish by simple clicking or touching them with your finger. 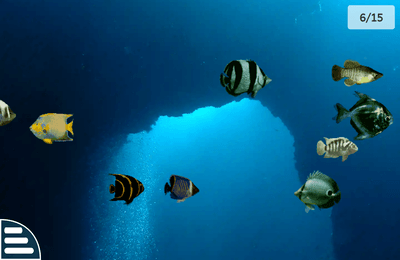 Credit: Fish are taken from the Unix utility xfishtank. All image credits belong to Guillaume Rousse. 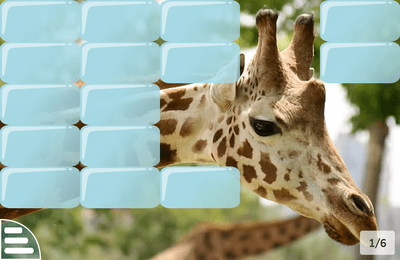 Manual: Move the mouse or touch the screen until all the blocks disappear. 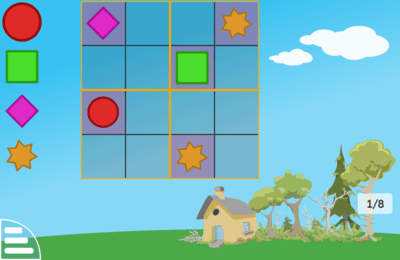 Manual: Double tap or double click the mouse on rectangles until all the blocks disappear. 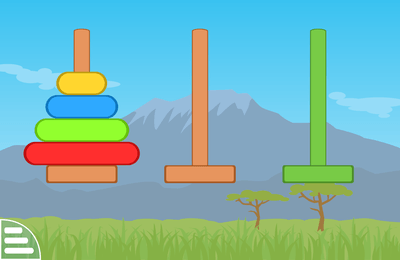 Manual: Click or tap on the blocks all of them disappear. Description: The fireman needs to stop the fire, but the hose is blocked. 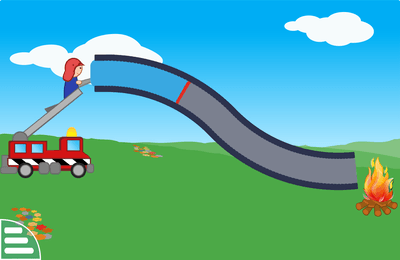 Manual: Move the mouse or your finger over the lock which is represented as a red part in the hose-pipe. This will move it, bringing it, part by part, up to the fire. Be careful, if you move off the hose, the lock will go backward. 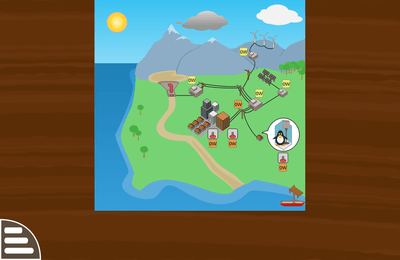 Description: Use the mousewheel to approach the rockwall and look for gold nuggets. Prerequisite: You should be familiar with moving the mouse and clicking. Goal: Learn to use the mousewheel or the zoom / pinch gesture to zoom in and out. 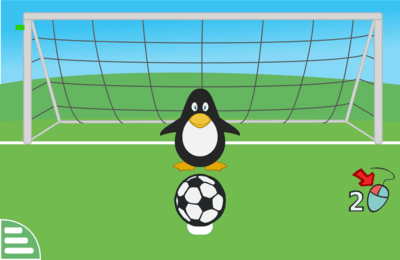 Description: Double click or double tap on any side of the goal in order to score. Manual: Look at the two sequences. 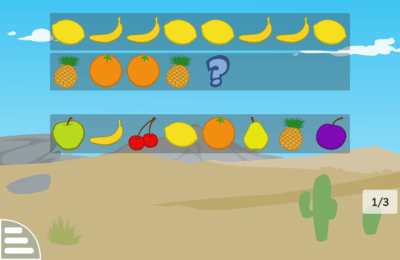 Each fruit in the first sequence has been replaced by another fruit in the second sequence. 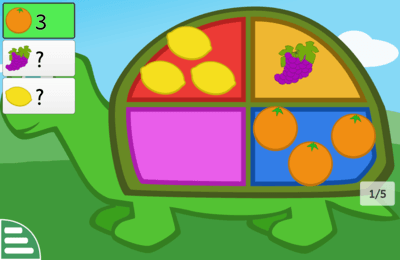 Complete the second sequence by using the correct fruits, after studying this pattern. Goal: Motor coordination. 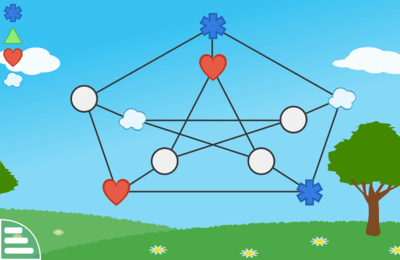 Conceptual matching. Manual: In the main board area, a set of objects is displayed. In the vertical box (at the left of the main board) another set of objects is shown, each object in the group on the left matching exactly one object in the main board area. 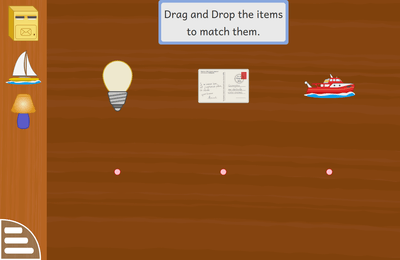 This game challenges you to find the logical link between these objects. How do they fit together? 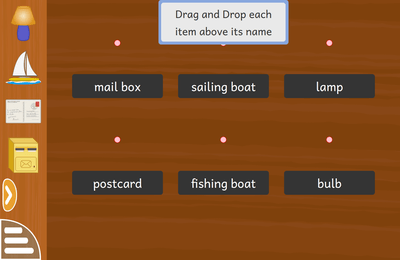 Drag each object to the correct red space in the main area. 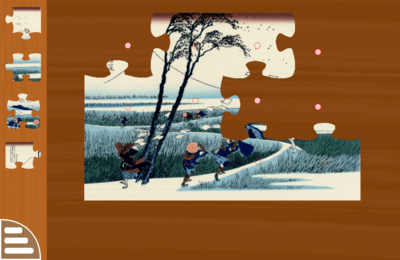 Manual: Complete the puzzle by dragging each piece from the set of pieces on the left, to the matching space in the puzzle. Goal: Let children discover the Braille system. 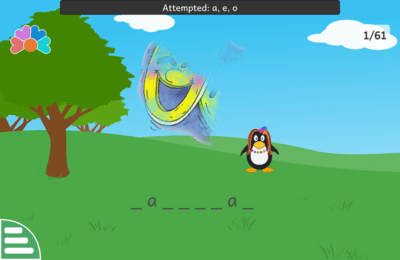 Manual: Enter the braille code in the tile for the letters on the banner pulled by Tux in his plane across the screen. Check the braille chart by clicking on the toggle button for help. 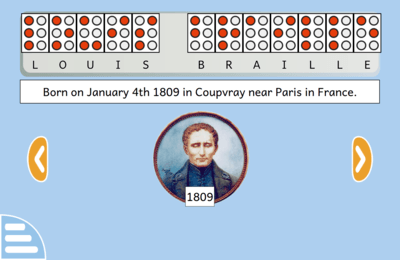 Manual: Read the history of Louis Braille, his biography, and the invention of the Braille system. Click on the previous and next buttons to move between the story pages. At the end, arrange the sequence in chronological order. Manual: Read the instructions and select the correct date on the calendar. Credit: Moon photo is copyright NASA. 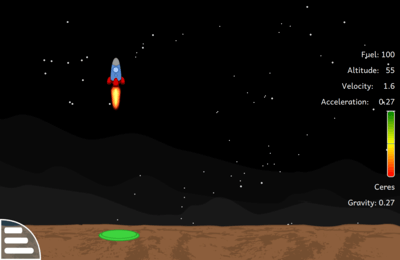 The space sounds come from Tuxpaint and Vegastrike which are released under the GPL license. The transportation images are copyright Franck Doucet. Dates of Transportation are based on those found in <http://www.wikipedia.org>. Prerequisite: The concept of time. Goal: Distinguish between time-units (hour, minute and second). Set and display time on an analog clock. 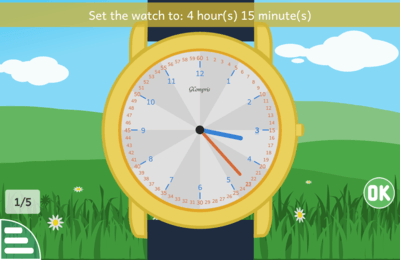 Manual: Set the clock to the given time, in the time-units shown (hours:minutes or hours:minutes:seconds). 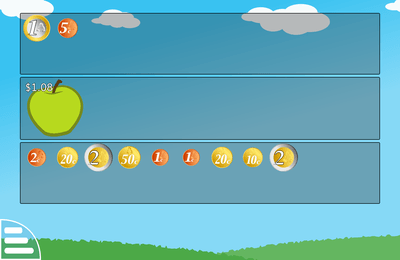 Drag the different arrows, to make the respective time unit go up or down. Goal: This activity teaches you to recognize different colors. When you hear the name of the color, touch the duck wearing it. 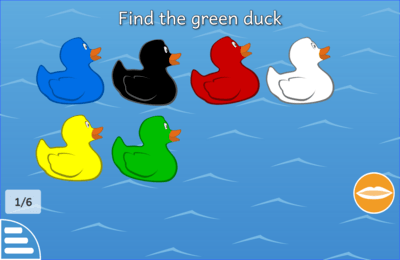 Manual: Listen to the color and touch the matching duck. Goal: Learn to recognize unusual colors. 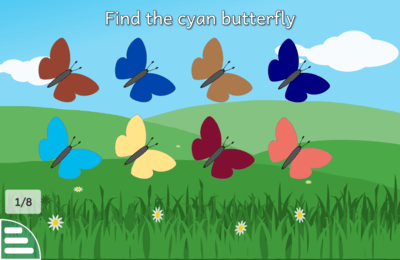 Manual: You will see dancing butterflies of different colors and a question. You have to find the correct butterfly and touch it. Credit: The images are from Wikimedia Commons. Description: Explore Monuments around the world. Prerequisite: Knowledge of different monuments. Goal: To learn about different monuments on the basis of their location. Manual: Click on the given keys to learn more of the monuments and then identify where the monuments is on the map by its name. Credit: Photos taken from Wikipedia. 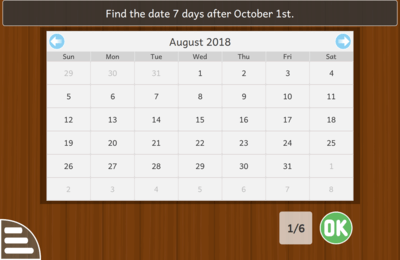 Description: Find the correct date and select it on the calendar. Goal: Learn how to count days and find a date on a calendar. Manual: Read the instructions and perform the requested calculation to find a date. Then select this date on the calendar. 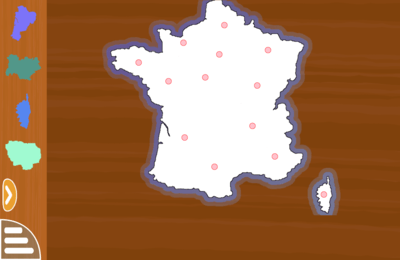 Manual: Drag and drop different regions of the country to correct locations to redraw the whole country. 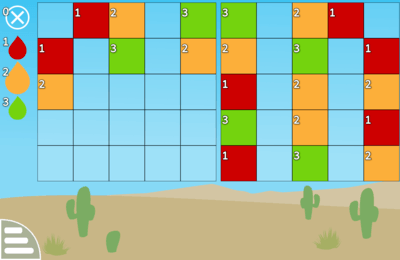 Manual: Drag and drop the map pieces to correct locations to redraw the whole map. Manual: You can see a hand: is it a left hand or a right hand? 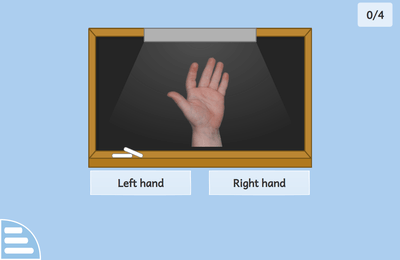 Click on the left button, or the right button depending on the displayed hand. Manual: A set of blank cards is shown. Each card has a picture on the other side, and each picture card has a twin exactly the same. Click on a card to see its hidden picture, and try to match the twins. 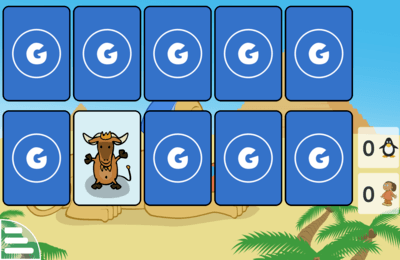 You can only turn over two cards at once, so you need to remember where a picture is, while you look for its twin. When you turn over the twins, they both disappear. Manual: A set of blank cards is shown. Each card has a picture on the other side, and each picture card has a twin exactly the same. Click on a card to see its hidden picture, and try to match the twins. You can only turn over two cards at once, so you need to remember where a picture is, while you look for its twin. When you turn over the twins, they both disappear. Tux teacher do the same. 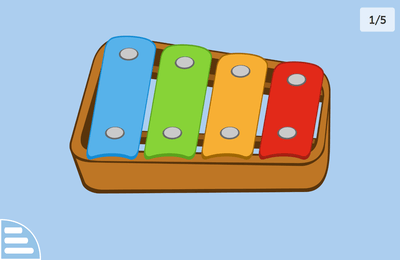 Manual: Listen to the sound sequence played, and repeat it by clicking on the xylophone's bars. You can listen again by clicking on the repeat button. Goal: Train your audio memory and remove all the cards. Manual: A set of cards is shown. 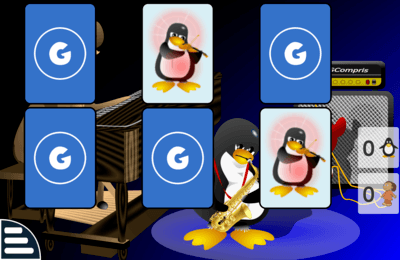 Each card has an associated sound, and each sound has a twin exactly the same. Click on a card to hear its hidden sound, and try to match the twins. You can only activate two cards at once, so you need to remember where a sound is, while you listen to its twin. When you turn over the twins, they both disappear. 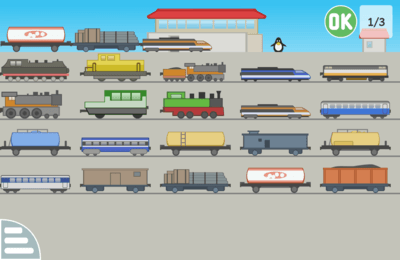 Description: Rebuild the displayed train at the top of the screen by dragging the appropriate carriages and locomotive. Deselect an item by dragging it down. Manual: A train - a locomotive and carriage(s) - is displayed at the top of the main area for a few seconds. Rebuild it at the top of the screen by dragging the appropriate carriages and locomotive. Deselect an item by dragging it down. 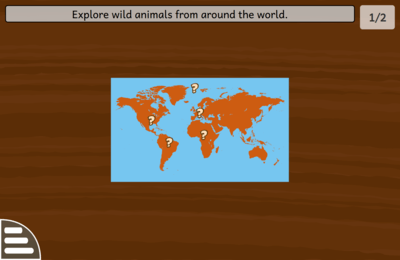 Description: Learn about world animals, interesting facts and their location on a map. 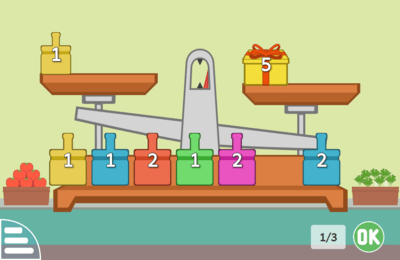 Description: Put each item at the same place as in the given example. Goal: Learn to recognize musical instruments. Manual: Click on the correct instrument. 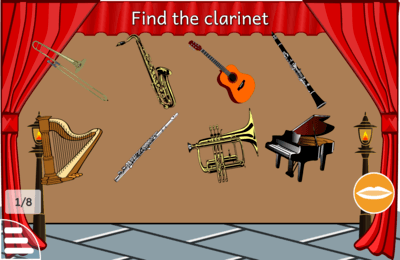 Description: Learn the names of the notes, in bass and treble clef. Goal: To develop a good understanding of note position and naming convention. To prepare for the piano player and composition activity. Manual: Identify the notes correctly and score a 100% to complete a level. 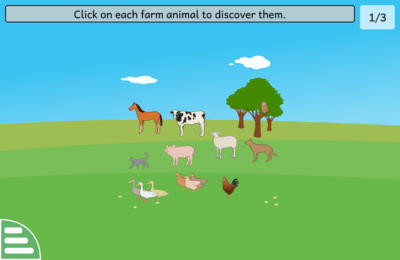 Description: Learn about farm animals, what sounds they make, and interesting facts. Goal: Learn to associate animal sounds with the animal name and what the animal looks like. 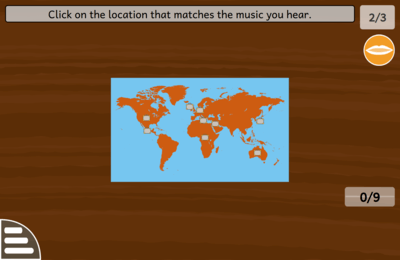 Description: Learn about the music of the world. 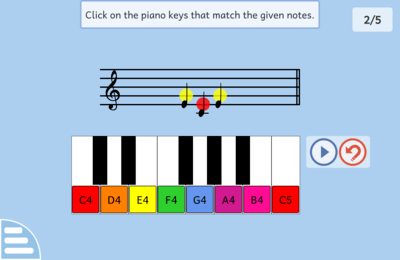 Description: An activity to learn how the piano keyboard works, how notes are written on a musical staff and explore music composition by loading and saving your work. Prerequisite: Familiarity with note naming conventions, note-names activity useful to learn this notation. Goal: Develop an understanding of music composition, and increase interest in making music with a piano keyboard. This activity covers many fundamental aspects of music, but there is much more to explore about music composition. 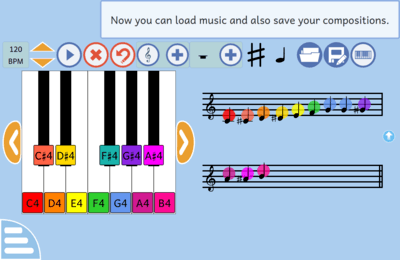 If you enjoy this activity but want a more advanced tool, try downloading Minuet (https://minuet.kde.org/), an open source software for music education or MuseScore (http://musescore.org/en/download), an open source music notation tool. Prerequisite: Knowledge of musical notation and musical staff. Play the activity named 'Piano Composition' first. Goal: Understand how the piano keyboard can play music as written on the musical staff. Manual: The notes you see will be played to you. 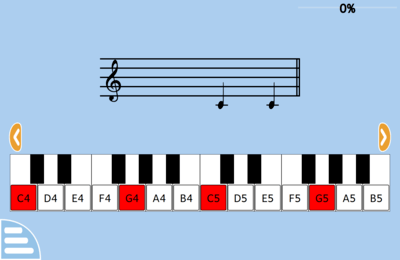 Click on the corresponding keys on the keyboard that match the notes you hear and see. Prerequisite: Simple understanding of musical rhythm and beat. Goal: Learn to beat rhythms precisely and accurately based on what you see and hear. Manual: Listen to the rhythm played, and follow along with the music. 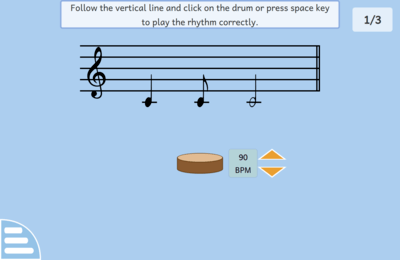 When you're ready to perform the identical rhythm, click the drum to the rhythm. If you clicked tempo at correct times, another rhythm is displayed. If not, you must try again. 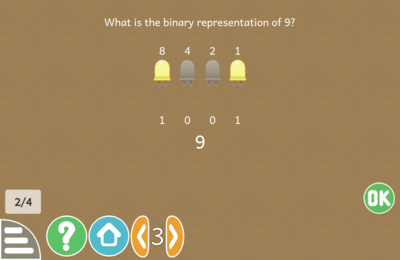 Description: This activity helps you to learn the concept of conversion of decimal number system to binary number system. Manual: Turn on the right bulbs to represent the binary of the given decimal number. When you have achieved it, press OK. Description: Tux is in trouble, and needs to take his boat through a lock. 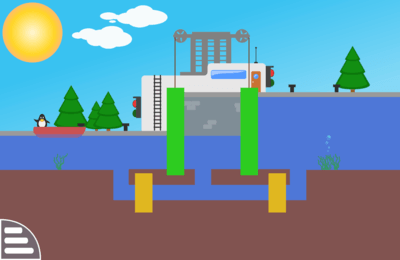 Help Tux and find out how a canal lock works. Manual: You are in charge of the canal lock. 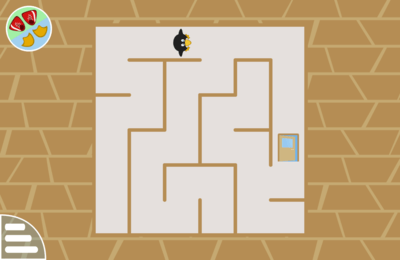 Open the gates and the locks in the right order, so Tux can travel through the gates in both directions. Credit: Drawing by Stephane Cabaraux. 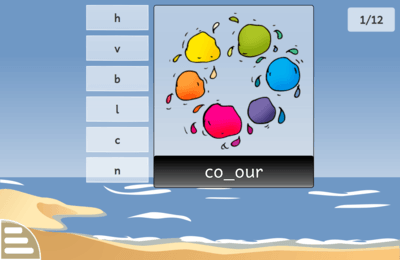 Description: Discover paint color mixing. 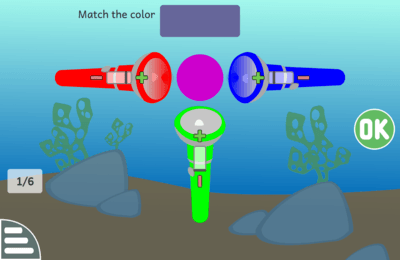 Description: Discover light color mixing. Goal: Mix the primary colors to match to the given color. Manual: Follow the instructions when you run the activity. Description: Understanding acceleration due to gravity. Goal: Pilot the spaceship towards the green landing area. Description: Tux has come back from fishing on his boat. Bring the electrical system back up so he can have light in his home. 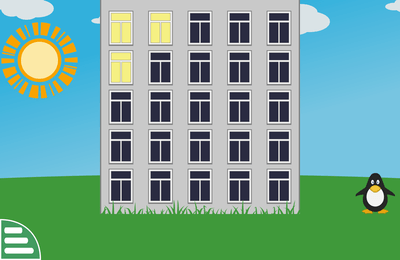 Manual: Click on different active elements: sun, cloud, dam, solar array, wind farm and transformers, in order to reactivate the entire electrical system. When the system is back up and Tux is in his home, push the light button for him. To win you must switch on all the consumers while all the producers are up. Description: Answer the questions with a correctness of 100%. 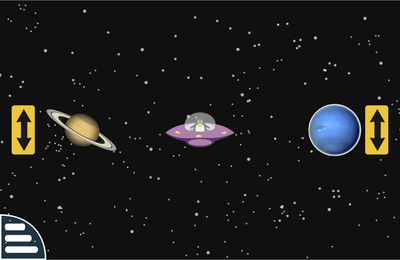 Goal: Learn information about the solar system. 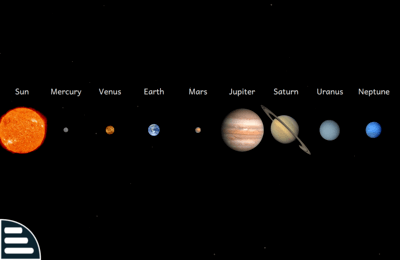 If you want to learn more about astronomy, try downloading KStars (https://edu.kde.org/kstars/) or Stellarium (http://stellarium.org/) which are open source astronomy softwares. 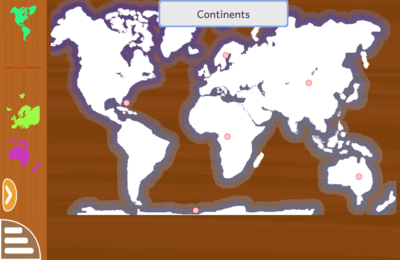 Manual: Click on a planet or the Sun to reveal questions. Each question contains 4 options. One of those is 100% correct. Try to answer the questions until you get a 100% closeness in the closeness meter. Description: Tux has come back from fishing on his boat. Bring the water system back up so he can take a shower. 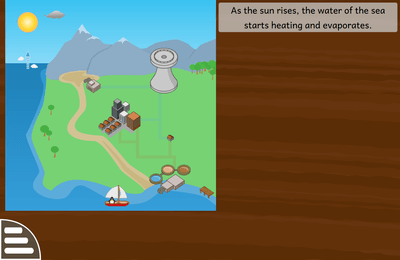 Manual: Click on different active elements: sun, cloud, pumping station, and the sewage treatment plant, in order to reactivate the entire water system. When the system is back up and Tux is in the shower, push the shower button for him. Prerequisite: Requires some basic understanding of the concept of digital electronics. Goal: Freely create a digital electric schema with a real time simulation of it. Manual: Drag electrical components from the selector and drop them in the working area. In the working area, you can move the components by dragging them. To delete a component, select the deletion tool on top of the component selector, and select the component. You can click on the component and then on the rotate button to rotate it or info button to get information about it. You can click on the switch to open and close it. To connect two terminals, click on first terminal, then on second terminal. To deselect terminal or delete tool, click on any empty area. The simulation is updated in real time by any user action. 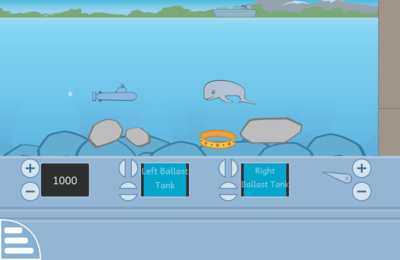 Description: Drive the submarine to the end point. Manual: Drag a line from the ball, to set its speed and direction. Manual: Try to find the strawberry under the blue fields. The fields become redder as you get closer. 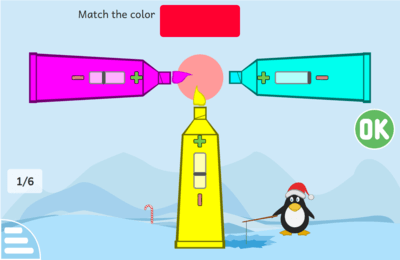 Manual: Select a color and paint the rectangles as you like to create a drawing. Description: Guess the letters of the given word. To help you, on every wrong try, a part of the image representing the word will be revealed. Goal: This is a good exercise to improve reading and spelling skills. Manual: You can enter the letters using the virtual keyboard on the screen or with the real keyboard. Manual: An addition is displayed on the screen. Quickly find the result and use your computer's keyboard or the on-screen keypad to type it. You have to be fast and submit the answer before the penguins land in their balloon! Goal: Throw darts at a target and count your score. 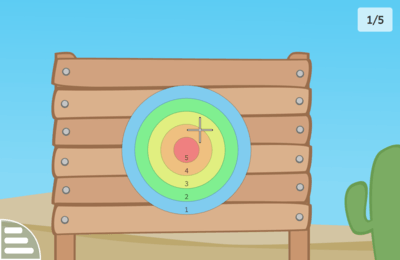 Manual: Check the speed and direction of the target, and then click on it to launch a dart. When all your darts are thrown, you are asked to count your score. Enter the score with the keyboard. Manual: A division is displayed on the screen. Quickly find the result and use your computer's keyboard or the on-screen keypad to type it. 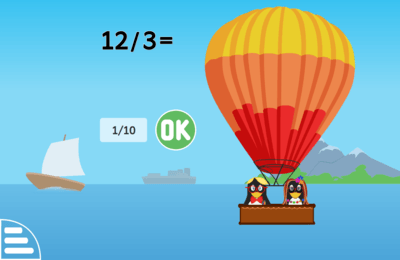 You have to be fast and submit the answer before the penguins in their balloon land! Description: Draw perfectly the given image on the empty grid. Manual: First, select the proper color from the toolbar. 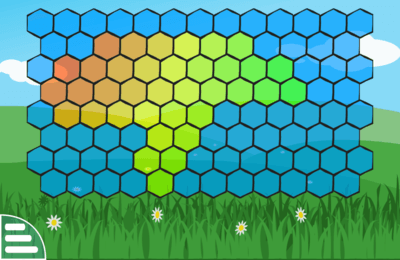 Then click on the grid and drag to paint, then release the click to stop painting. Description: Draw the image on the empty grid as if you see it in a mirror. 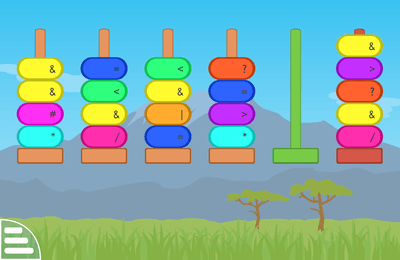 Description: Guide the Number Muncher to the expressions that equal the number at the bottom of the screen. Goal: Practice addition, multiplication, division and subtraction. 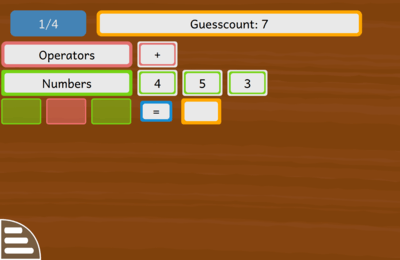 Manual: Guide the Number Muncher to the expressions that equal the number at the bottom of the screen. 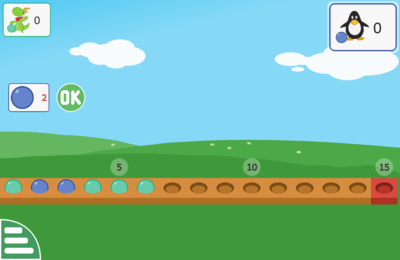 Description: Guide the Number Muncher to all the factors of the number at the bottom of the screen. Goal: Learn about multiples and factors. Manual: The factors of a number are all the numbers that divide that number evenly. 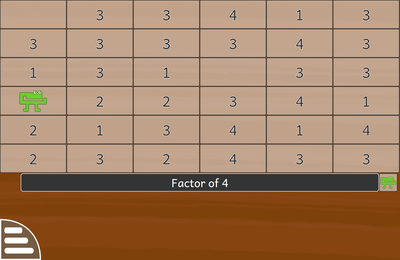 For example, the factors of 6 are 1, 2, 3 and 6. 4 is not a factor of 6 because 6 cannot be divided into 4 equal pieces. If one number is a multiple of a second number, then the second number is a factor of the first number. 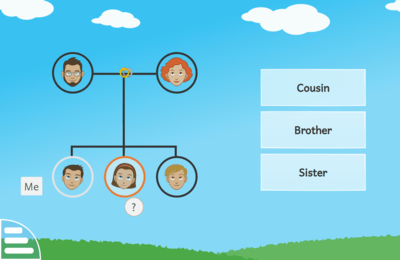 You can think of multiples as families, and factors are the people in those families. So 1, 2, 3 and 6 all fit into the 6 family, but 4 belongs to another family. 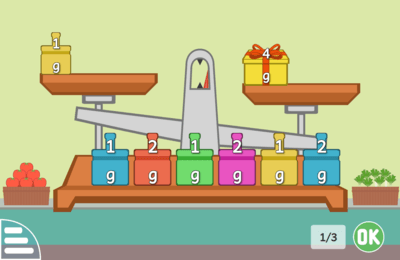 Description: Guide the Number Muncher to all the expressions that do not equal the number at the bottom of the screen. Goal: Practice addition, subtraction, multiplication and division. Manual: If you have a keyboard you can use the arrow keys to move and hit space to swallow a number. 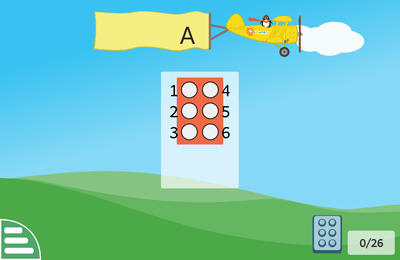 With a mouse you can click on the block next to your position to move and click again to swallow the number. With a touch screen you can do like with a mouse or swipe anywhere in the direction you want to move and tap to swallow the number. 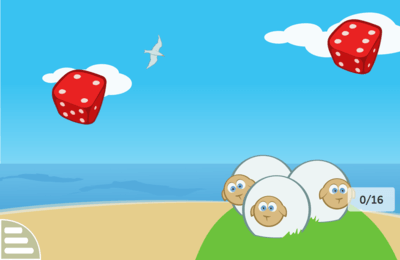 Description: Guide the Number Muncher to all the multiples of the number at the bottom of the screen. Manual: The multiples of a number are all the numbers that are equal to the original number times another number. For example, 24, 36, 48 and 60 are all multiples of 12. 25 is not a multiple of 12 because there isn't any number that can be multiplied by 12 to get 25. If one number is a factor of a second number, then the second number is a multiple of the first number. Again, you can think of multiples as families, and factors are the people who belong to those families. The factor 5, has parents 10, grandparents 15, great-grandparents 20, great-great-grandparents 25, and every extra step of 5 is another great- in front! But the number 5 does not belong in the 8 or 23 families. You can't fit any number of 5s into 8 or 23 with nothing left over. So 8 isn't a multiple of 5, nor is 23. Only 5, 10, 15, 20, 25 ... are multiples (or families or steps) of 5. 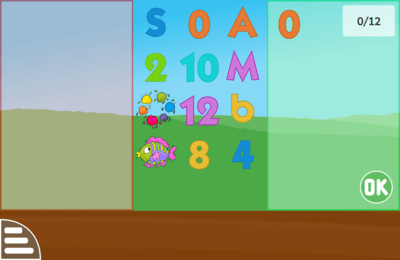 Description: Guide the Number Muncher to all the prime numbers. Goal: Learn about prime numbers. Manual: Prime numbers are numbers that are only divisible by themselves and 1. For example, 3 is a prime number, but 4 isn't (because 4 is divisible by 2). You can think of prime numbers as very small families: they only ever have two people in them! Only themselves and 1. You can't fit any other numbers into them with nothing left over. 5 is one of these lonely numbers (only 5 × 1 = 5), but you can see that 6 has 2 and 3 in its family as well (6 × 1 = 6, 2 × 3 = 6). So 6 is not a prime number. 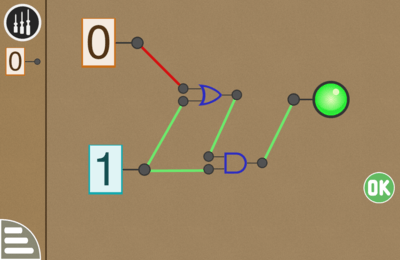 Description: Color the graph so that no two adjacent nodes have the same color. Goal: Learn to distinguish between different colors/shapes and learn about relative positions. 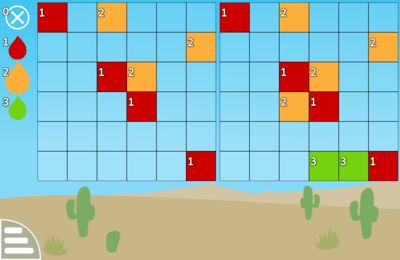 Description: Guess the algebraic expression and drag the tiles to get a result equal to the Guesscount. Goal: Intuition and practice of algebraic-like calculations. Description: Turn the cards over to find two numbers which add up the same, until all the cards are gone. Goal: Practice adding up, until all the cards are gone. 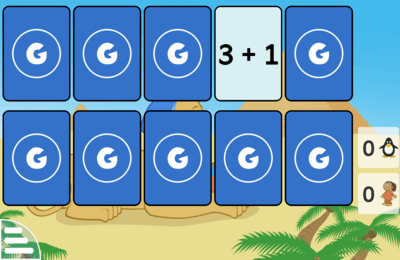 Description: Turn the cards over to find two numbers which add or subtract the same, until all the cards are gone. Goal: Practice addition, subtraction, until all the cards are gone. 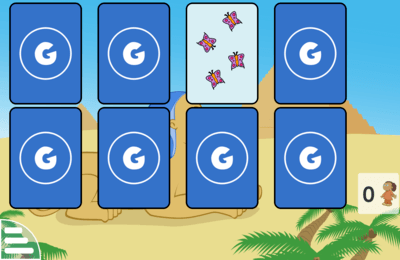 Description: Turn the cards over to find a matching operation, until all the cards are gone. Goal: Practice addition, subtraction, multiplication, division, until all the cards are gone. Description: Turn the cards over to find two numbers which add up the same, until all the cards are gone. Tux will do the same. You have to beat it! Goal: Practice division, until all the cards are gone. Description: Turn the cards over to find two numbers which subtract the same, until all the cards are gone. Goal: Practice subtraction, until all the cards are gone. 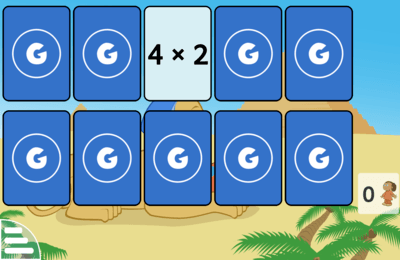 Description: Turn the cards over to find two numbers which multiply the same, until all the cards are gone. Goal: Practice multiplication, until all the cards are gone. Goal: Practice multiplication, division, until all the cards are gone. 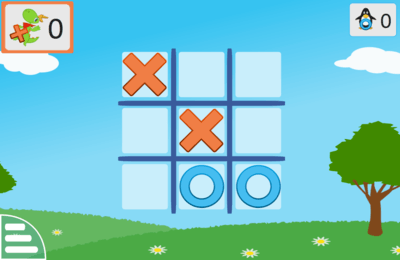 Manual: A multiplication is displayed on the screen. Quickly find the result and use your computer's keyboard or the on-screen keypad to type the product of the numbers. You have to be fast and submit the answer before the penguins in their balloon land! 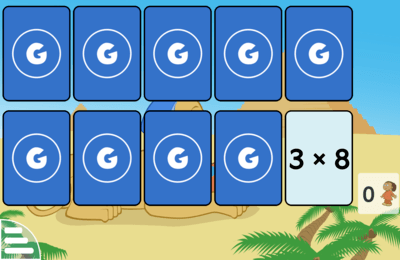 Goal: Learning how to draw the numbers in a funny way. Manual: First, properly organize the items so that you can count them. 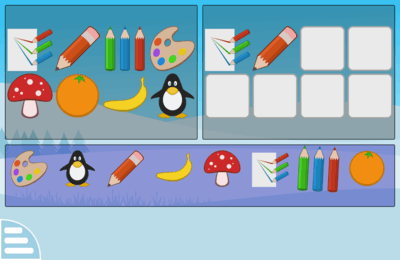 Then, select the item you want to answer in the bottom right area. Enter the answer with the keyboard. 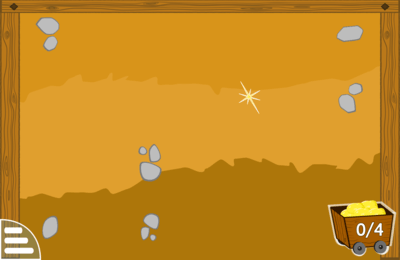 Description: Help Tux escape the cave. Tux hides a number for you to find. Prerequisite: Numbers from 1 to 1000 for the last level. Manual: Read the instructions that give you the range of the number to find. Enter a number in the top right entry box. You will be told if your number is higher or lower. Then enter another number. 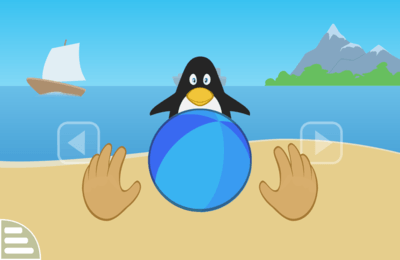 The distance between Tux and the escape area on the right represents how far you are from the correct number. 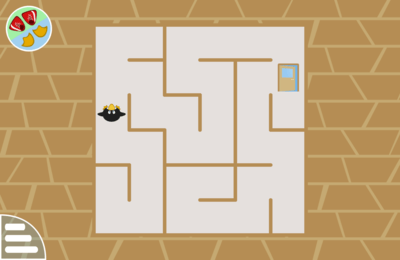 If Tux is over or under the escape area, it means your number is over or under the correct number. Manual: Click on the hat to open it. Stars go in and a few stars escape. You have to count how many are still under the hat. 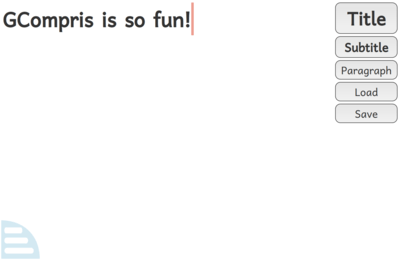 Click on the bottom area to input your answer and on the OK button to validate your answer. Manual: Click on the hat to open it. Under the hat, how many stars can you see moving around? Count carefully. Click on the bottom area to input your answer and on the OK button to validate your answer. Description: Turn the cards over to match the number with the drawn picture. Manual: You can see some cards, but you can't see what's on the other side of them. Each card is hiding a number of pictures, or the written number. Goal: You must buy the different items and give the exact price. At higher levels, several items are displayed, and you must first calculate the total price. Manual: Click or tap on the coins or paper money at the bottom of the screen to pay. If you want to remove a coin or note, click or tap on it on the upper screen area. 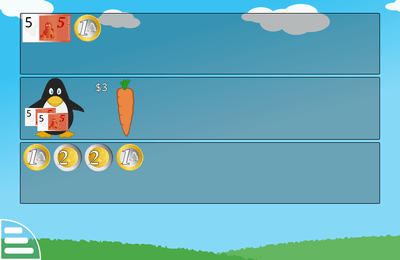 Goal: Tux bought different items from you and shows you his money. You must give him back his change. At higher levels, several items are displayed, and you must first calculate the total price. Manual: Click on the coins or paper money at the bottom of the screen to pay. 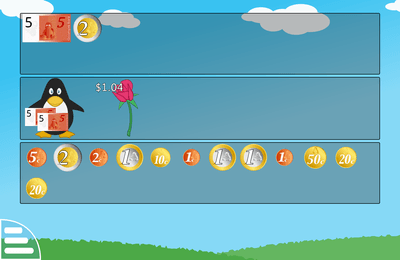 If you want to remove a coin or note, click on it on the upper screen area. 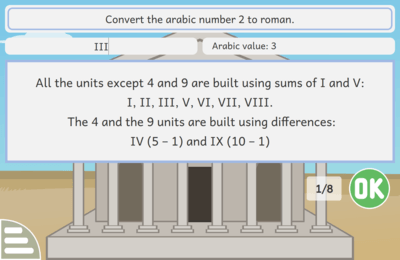 Description: Touch the numbers in the right sequence. Goal: Can count from 1 to 50. 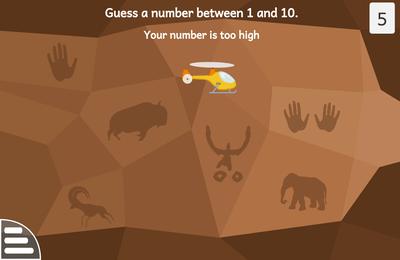 Manual: Draw the picture by touching each number in the right sequence, or sliding your finger or dragging the mouse through the numbers in the correct sequence. Manual: Catch the odd or even number clouds. 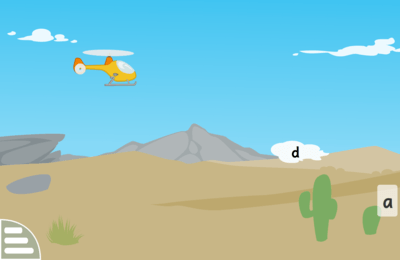 With a keyboard use the arrow keys to move the helicopter. With a pointing device you just click or tap on the target location. To know which number you have to catch you can either remember it or check the bottom right corner. Manual: Catch the clouds in increasing order. 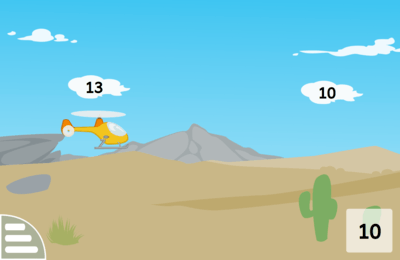 With a keyboard use the arrow keys to move the helicopter. With a pointing device you just click or tap on the target location. To know which number you have to catch you can either remember it or check the bottom right corner. Description: Tux is hungry. Help him find fish by counting to the correct ice spot. Goal: Tux is hungry. Help him find fish by counting to the correct ice spot. 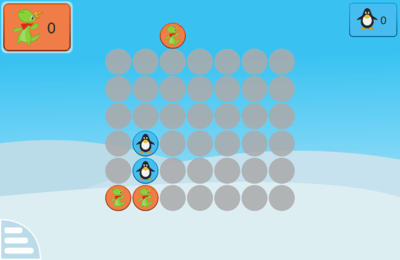 Manual: Click on the domino to show how many ice spots there are between Tux and the fish. 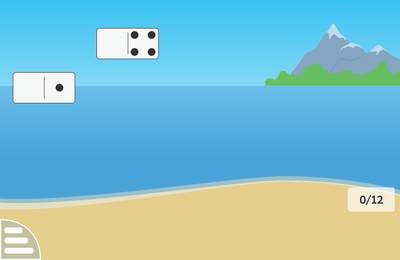 Click the domino with the right mouse button to count backwards. When done, click on the OK button or hit the Enter key. 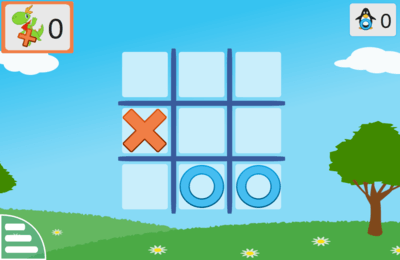 Manual: With the keyboard, type the number of dots you see on the falling dominoes. 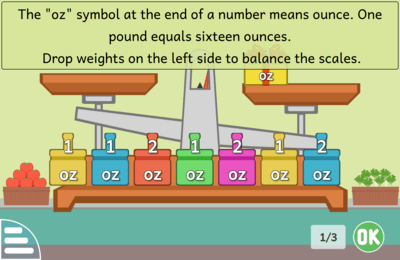 Manual: To balance the scales, move the weights to the left or the right side (on higher levels). The weights can be arranged in any order. Manual: To balance the scales, move the masses to the left or the right side (on higher levels). They can be arranged in any order. Take care of the weight and the unit of the masses, remember that a kilogram (kg) is 1000 grams (g). Manual: To balance the scales, move the masses to the left or the right side (on higher levels). They can be arranged in any order. Take care of the weight and the unit of the masses, remember that a pound (lb) is 16 ounce (oz). Manual: Follow the instructions shown on the screen: first, drag the given number of boys/girls to the middle, then drag pieces of candy to each child's rectangle. 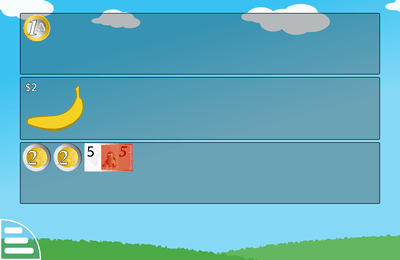 Manual: A subtraction is displayed on the screen. Quickly find the result and use your computer's keyboard or the on-screen keypad to type it. 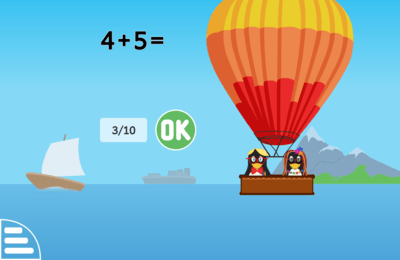 You have to be fast and submit the answer before the penguins in their balloon land! 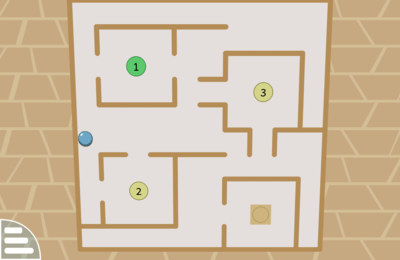 Description: Navigate the ball to the door by tilting the box. Goal: Practice fine motor skills and basic counting. 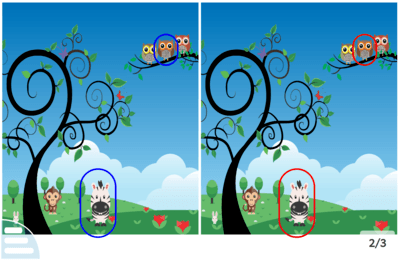 Manual: Move the items in the left frame to copy their position in the right model. Next to the crane itself, you will find four arrows that let you move the items. To select the item to move, just click on it. If you prefer, you can use the arrow keys and the space or tab key instead. On a mobile version, you can also swipe up/down/left/right to move the items in the left frame. Description: Move each item to recreate the image. Manual: Click or drag on any pieces that has a free block beside it, and it will be swapped with the empty one. 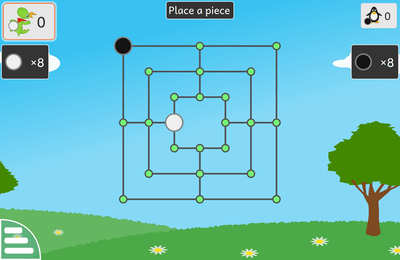 Manual: Drag and Drop one top piece at a time, from one peg to another, to reproduce the tower on the right in the empty space on the left. Credit: Concept taken from EPI games. Manual: Drag and drop the top pieces only from one peg to another, to reproduce the initial left side tower on the right peg. Description: The aim is to switch off all the lights. Goal: The aim is to switch off all the lights. Manual: The effect of pressing a button is to toggle the state of that button, and of its immediate vertical and horizontal neighbors. 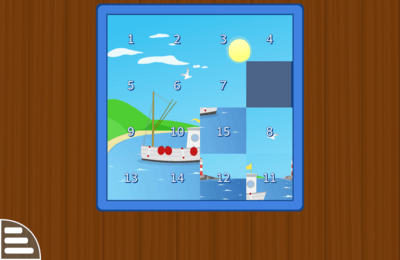 The sun and the color of the sky depend on the number of clicks needed to solve the puzzle. If you click on Tux, the solution is shown. 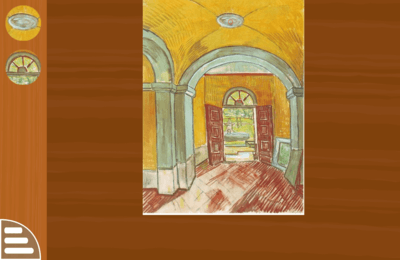 Manual: Drag the image parts from the box on the left to create a painting on the main board. Description: Find the differences between the two pictures! Manual: Observe the two pictures carefully. There are some slight differences. When you find a difference you must click on it. Description: Symbols must be unique in a row, in a column, and (if defined) each region. 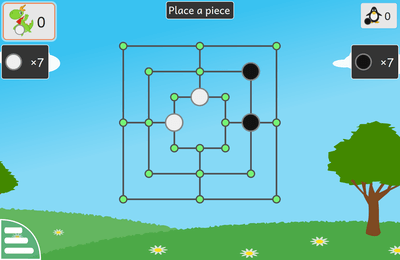 Goal: The aim of the puzzle is to enter a symbol or numeral from 1 through 9 in each cell of a grid. In the official Sudoku the grid is 9x9 made up of 3x3 subgrids (called 'regions'). 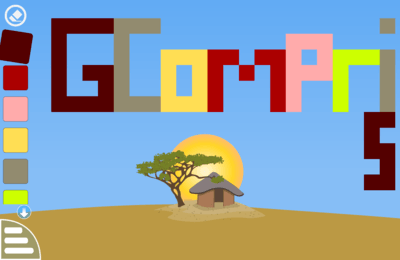 In GCompris we start at lower levels with a simpler version using symbols and with no regions. In all cases the grid is presented with various symbols or numerals given in some cells (the 'givens'). Each row, column and region must contain only one instance of each symbol or numeral (Source <http://en.wikipedia.org/wiki/Sudoku>). 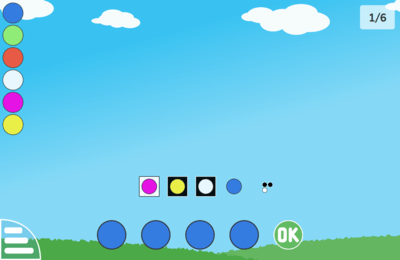 Manual: Select a number or a symbol on the left and click on its target position. GCompris will not let you enter invalid data. Manual: Click on the items until you find what you think is the correct answer. Then, click on the OK button. 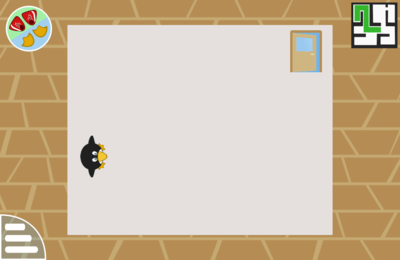 In the lower levels, Tux gives you an indication if you found a hiding place by marking the item with a black box. In the levels 4 and 8 an item may be hidden several times. 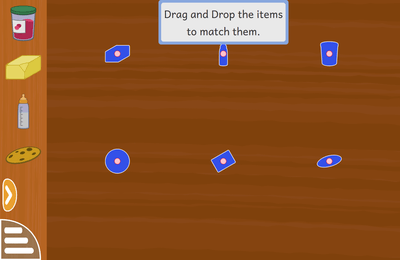 You can use the right mouse button to flip the items in the opposite order or the item chooser to directly pick an item. 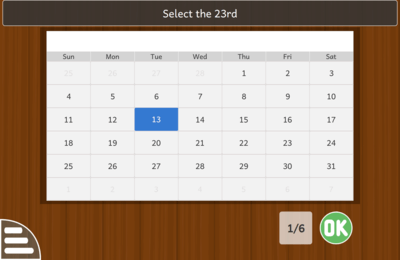 Press and hold a mouse button or on the touch screen to automatically choose the last item selected on a column. Double click or tap on a previously selected item in your guess history to mark it as 'correct'. Such marked items are automatically selected in your current and future guesses until you un-mark them, again by double clicking or tapping. Manual: Select the tangram to form. 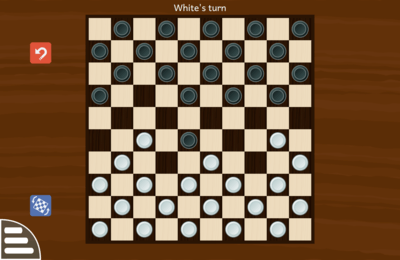 Move a piece by dragging it. The symmetrical button appears on items that supports it. Click on the rotation button or drag around it to show the rotation you want. 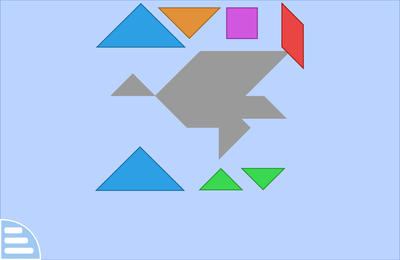 At first levels, simpler objects are used to introduce the tangram concept. Manual: Each car can only move either horizontally or vertically. 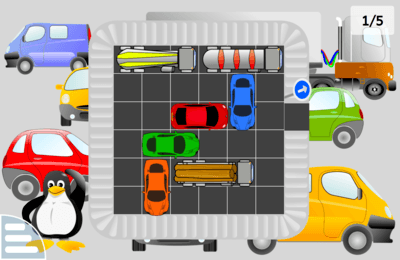 You must make some room in order to let the red car move through the gate on the right. Manual: Catch the alphabet letters. 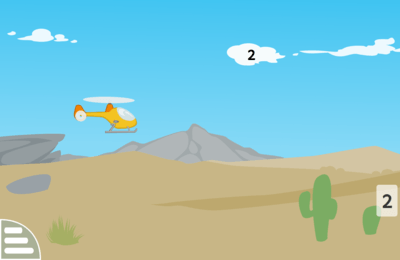 With a keyboard use the arrow keys to move the helicopter. With a pointing device you just click or tap on the target location. To know which letter you have to catch you can either remember it or check the bottom right corner. Manual: A letter is spoken. Click on the matching letter in the main area. You can listen to the letter again, by clicking on the mouth icon. Manual: A letter is spoken. Click on the matching letter in the main area. You can listen to the letter again, by clicking on the mouth icon in the bottom box. Goal: Learning how to draw the letters in a funny way. 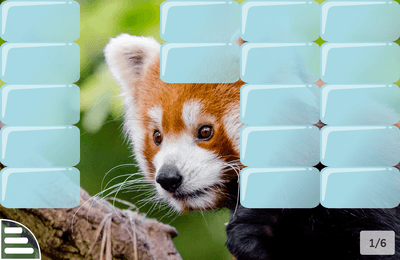 Manual: Drag each image from the (vertical) box on the left to its (corresponding) name on the right. Click the OK button to check your answer. 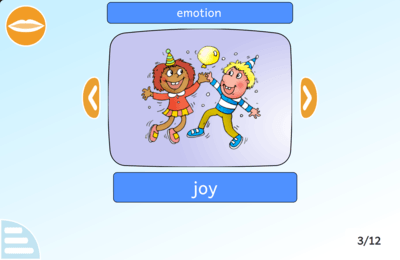 Description: Complete language learning activities. Goal: Enrich your vocabulary in your native language or in a foreign one. Credit: The images and voices come from the Art4Apps project: http://www.art4apps.org/. Description: A letter is written and/or spoken. 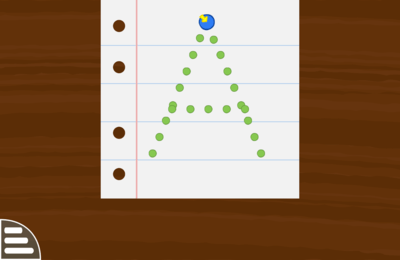 Some words are displayed, the children must find the word or the words in which this letter appears. Goal: Select all the words which contain the spoken letter. 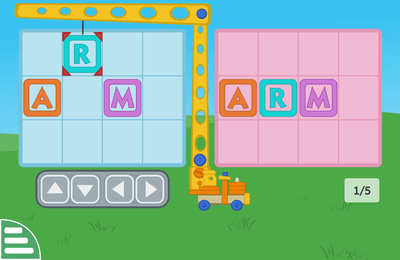 Manual: A letter is displayed on the flag attached to the plane, select all the words or the objects in which the letter appears and then press OK. 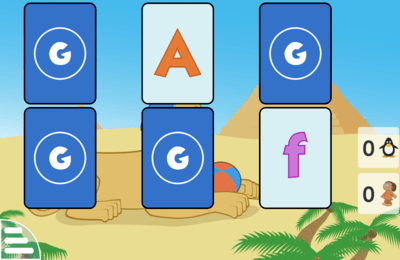 Description: Turn the cards over to match the alphabet with its lower/uppercase value. Goal: Learning lower and upper case alphabets, memory. Manual: You can see some cards, but you can't see what's on the other side of them. 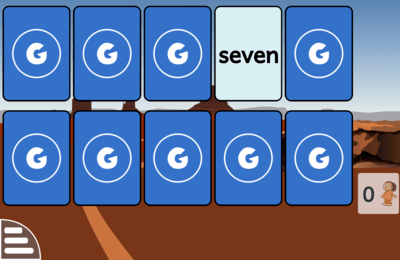 Each card is hiding the lower/uppercase of an alphabet, and you have to associate all the upper case letters with its lower case and vice versa. 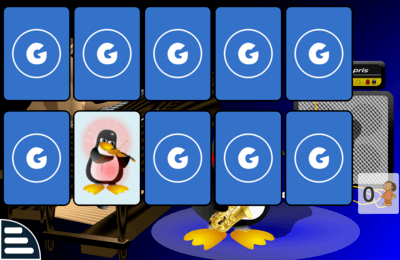 Description: Turn the cards over to match the alphabet with its lower/uppercase value against Tux. Manual: You can see some cards, but you can't see what's on the other side of them. Each card is hiding the lower/uppercase of an alphabet, and you have to associate all the upper case letters with its lower case and vice versa. Tux teacher does the same. Description: Turn the cards over to match the number with the word matching it. Manual: You can see some cards, but you can't see what's on the other side of them. 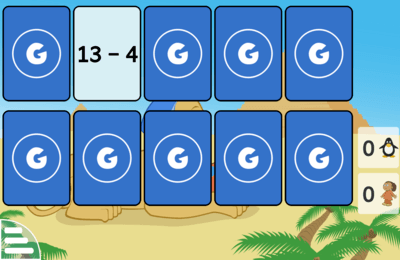 Each card is hiding the numeral form of a number, or the word to write it. 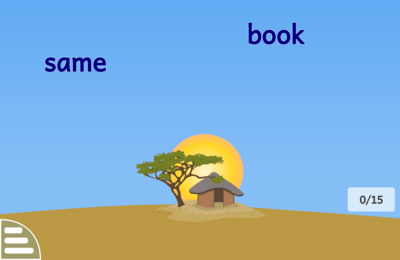 Manual: An object is displayed in the main area, and an incomplete word is printed under the picture. Select the missing letter to complete the word. 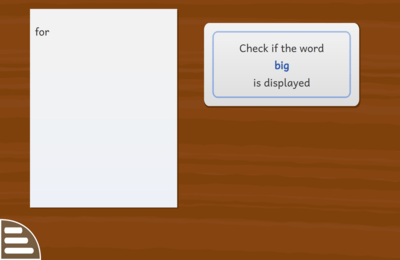 Description: Read a list of words and work out if a given word is in it. Manual: A word is shown on the board. A list of words, displayed horizontally, will appear and disappear. Does the given word belong to the list? 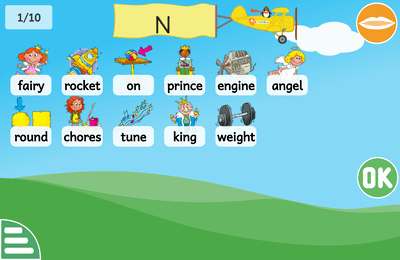 Description: Read a vertical list of words and work out if a given word is in it. Manual: A word is shown on the board. 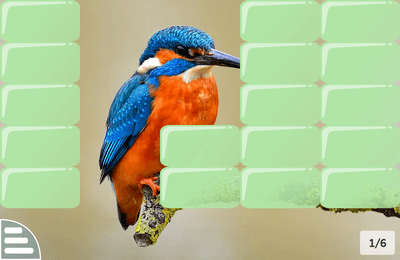 A list of words, displayed vertically, will appear and disappear. Does the given word belong to the list? 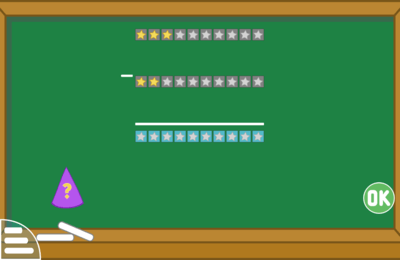 Goal: Create a line of 4 tokens either horizontally (lying down), vertically (standing up) or diagonally. 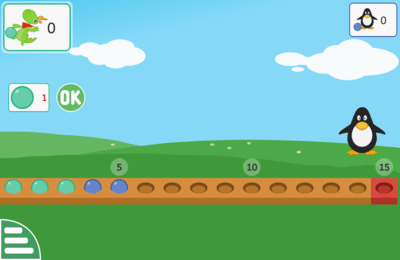 Description: Click the number of balls you wish to place in the holes and then click the OK button. The winner is the one who hasn't put a ball in the red hole. Manual: Place balls in the holes. You win if your friend has to place the last ball. 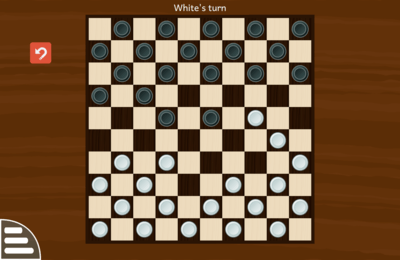 Description: The version in GCompris is the international draughts. 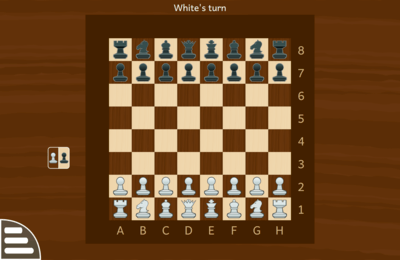 Goal: Capture all the pieces of your opponent before your opponent captures all of yours. 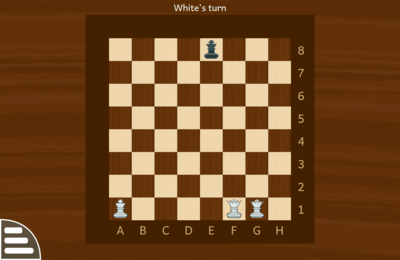 Credit: The chess engine is p4wn <https://github.com/douglasbagnall/p4wn>. 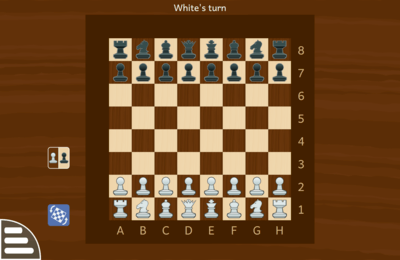 Description: Reduce the opponent to two pieces, or by leaving him without a legal move.